The Leading Embedded Computing Company! Embedian pioneered the concept of an extremely small computer-on-module and single board computers with full implementation of major operating systems, and we are the leading supplier in this industry now. We continue to provide some of the most innovative and modulized design and production solutions to our customers who design and build small devices. Embedian technology portfolio lowers costs, and gets our customers’ products to market ahead of their competition. The Embedian Developer Center brings all of our developer resources together in one place. This is a place where our team collaborates and shares knowledge with all developers. The Embedian Git Server is a place where users can get most update source tree or contribute their codes related to Embedian's products. Collection of frequent ask questions for developers. You can also add your questions or share your knowledge here. The project mangement site offers a place for issue tracking, forum, and knowledge base management. Here you can find many usual technical articals. APC-6410 is an SBC based on Samsung S3C6410 ARM1176JZF-S core processor clocking at 667Mhz that integrated Multi Format Codec (MFC) co-processor supports encoding and decoding of MPEG4/H.263/H.264 and decoding of VC1. This H/W Encoder/Decoder supports real-time video conferencing and TV out for both NTSC and PAL mode. Additional graphic 3D engine is a 3D Graphics Hardware Accelerator which can accelerate OpenGL ES 1.1 & 2.0 rendering. APC-6410 features state of the art technology, aiming at low power systems that require high CPU performance. 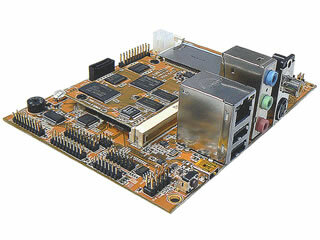 They also provide all the interfaces needed in a modern embedded device. It can be applied to the general-purposed embedded application or multimedia-related embedded application by taking advantages of the MFC co-processor. With Linux and Windows CE 6.0 supported, users can easily develop their original application from other platform or develop a new application on this platform.